Babadas - meherbabatravels jimdo page! In Pandharpur, he met M. D. Dharmale, known as Babadas (Baba's slave or servant), who was spreading Meher Baba's message in the area. 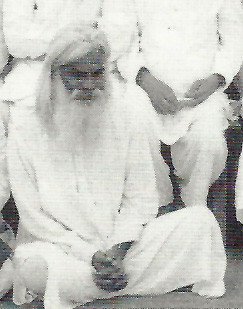 He was a resident of Nagpur and would travel from place to place speaking about Baba. Vibhuti had been doing the same since 1925 in different parts of India. Kaka was sent back to Bombay at this time, and Eruch joined Baba from Bangalore. Eruch brought his family and Gulamasi with him. They, too, were to have joined Baba in Ceylon, and had been vaccinated before Baba changed the plan. Babadas came to Calicut three times, but Baba did not see him, for he was still in seclusion and did not wish his work to be disturbed. One day, however, according to Eruch, Don was on his way to the Post Office when from a distance he spotted a disheveled, bearded figure in a long robe, who he thought was a mast. He reported this to Baba, who instructed Eruch and him to bring the person. When Don and Eruch approached the man, they were surprised to discover that it was Babadas! Baba had said to bring "the mast" to him, so he was brought and Baba chuckled at Don's mistake. To make all the necessary arrangements required for Baba's work, Pleader was sent to Allahabad ten days in advance. There he contacted a man named G. S. Srivastava, an Assistant Commissioner with the state government, who had first met Baba in 1938 and become an ardent follower. Srivastava was already planning to spread Baba's message of love at the Kumbha Mela. Vibhuti and Babadas were coming to Allahabad for the same purpose. But Baba instructed that, until his own work at the fair was over and he had left Allahabad, their work should not begin. Exhausted, Baba drank only a glass of ginger soda, and then took a hot tub-bath before going to bed. The next morning, Thursday, 1 January 1942, Baba was up by five o'clock, and after tea — in an especially good mood now that his work had been completed to his satisfaction — they left Allahabad by the Bombay Mail train. The day Baba left Allahabad, his life-size portrait from Meherabad arrived. Srivastava, Babadas, Vibhuti, Narayan Singh, Chaturvedi and Tirthraj Panday actively began their work at the Kumbha Mela. Rano's painting was carried in a large parade accompanied by music, and 8,000 leaflets with information about Meher Baba and his message were distributed. Thousands came to Srivastava's house to take darshan of the painting. They had no idea that the One whose darshan they were now having had bowed down at the feet of thousands of sadhus, and had been in their midst for two days, having clandestinely come and gone. 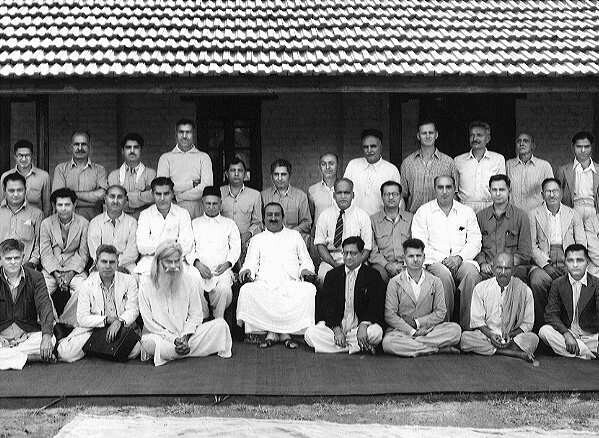 The twenty companions of Baba in the New Life included four women: Mehera J. Irani, Mani S. Irani, Meheru R. Irani and Dr. Goher R. Irani; and sixteen men: Adi K. Irani, Dr. William Donkin, Gustadji N. Hansotia, Dr. Nilkanth Godse (Nilu), Dr. A. Ghani Munsiff, A.R. Irani (Pendu), Sadashiv Shelke (Patel), Vishnu N. Deorukhkar, Murli R. Kale. Anna Jakkal, Babadas Dharmare, Dr. Daulat Singh, A.S. Baria (Kaka), R.B. Baiduliyan (Aga Baidul), Ali Akbar (Aloha) and Eruch B. Jessawala. When I asked Eruch, "According to you what is the importance of the New Life?" he said, " When we set out for the New Life, my only aim was to follow Baba, wherever he went. I never thought of any end result. In fact, none of us thought of any­ material or spiritual benefits which would accrue from following Baba into this new phase. We, as his mandali, fulfilled his every wish and whim and obeyed him wholeheartedly and without any reservations." Meher Baba with his male followers. Babadas is seated in the front row.